In the 19th century (the Victorian era), there was a visual phenomenon that expanded on the variety and overuse of type. On posters, a galore of type would be crowded into the compositions of the posters; sans-serif, serif, gothic, modern types and all others that could be accessed would be stuck together on a vertical axis. As the industry grew, as well as the available type-faces and the demand of commerce, artistic evaluation (in terms of stylistic coherence and composition) was often disregarded, or went to little discuss, in the creation of these posters. 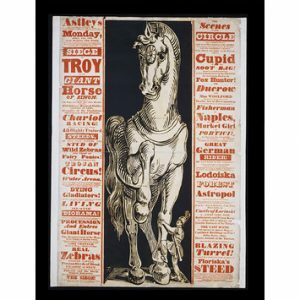 As seen by The Giant Horse of of Sinon, Astley’s Circus, 1833 (shown below), the chaotic use of type is present here. Along the sides of the image are the names of the acts and performers. Stylistically, there is a representation of the numerous acts that would occur during the night. Although the variance of type feels dissonant, the composition does express the drama and energy one would imagine feeling at a circus, especially with the use of the color red for the type as well as the contrasts in the sizes and weight of the typefaces. Today, we have the same use of type in variance, set up the same way composition-wise. In modern graphic designs, often times, numerous quotes will be taken and split up into various type-faces. 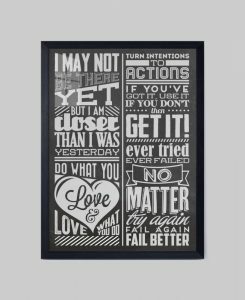 This example (sold by an online retailer), shows that the numerous forms of type actually create an effect of its own in the composition. The variance of type allows for each quote to attract attention individually. At times, certain type-faces may be used to express contextual meaning of the selected quote as well. For example, a quote about being an ‘uncompromising spirit’ may use slab serif text to show boldness, sturdiness or synonymous traits associated with the quote. In the image shown above, shape is created using negative space; the heart, that frames the word ‘Love’. In other designs, shape and image as well as the typeface used does high-light the contextual meaning of the quotes used. These modern graphic designs are clearly inspired by the 19th century type-face chaos, but the focus has become the overall image and the chaos of the composition. 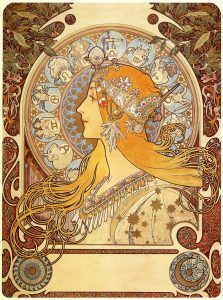 From this blog post, I would like to discuss the influence of Art Noveau to the current design trend in the 21th century, especially from the poster from movie Thor: Ragnarok with the Zodiac by Alphonso Mucha in particular. On the left side is the artwork “Zodiac” by Alphonso Mucha (1896). The artwork contains most of the significant characteristics of Art Noveau: the symmetrical composition, the dominant appearance of circular shapes, the big circle around the woman’s face implied the decorated halo surround her, inside the big circular contain smaller circle shapes with illustration of twelve zodiac signs and their symbols in monochrome, in contrast to the colorful, decorated circular shape of the whole design. The main character is a young, beautiful Western woman who has painted with flat, monochrome color, without any suggestive of perspective, realistic anatomy or lighting source, heavily influenced by the Ukyo-e art movement imported from Japan. 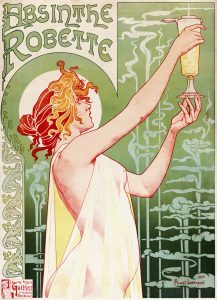 In Art Nouveau, there are always a variety of shapes and circular as a decoration, and to divide these shape to make sure that the design looks consistent and viewer still be able to focus on critical part, Mucha used thick, black line surround the object, and it can clearly see in part like the woman silhouette. 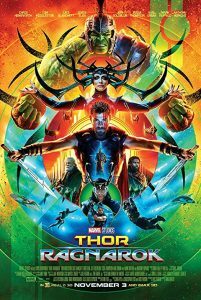 Back to the current trend poster of Thor: Ragnarok has the lot of similar characteristics that are profoundly influenced by the Art Noveau movement: the strictly symmetrical composition, the use of thick line to separate object on the poster, as we can see from the halo behind the main character who was holding two swords. Black colors are carefully applied to keep the color composition and color value consistent. The designer was also thoughtfully added small detail as spaceships, two characters who fought at the low end of a poster, and the beautifully designed horn of the main villain of the movie. And lastly, one other similarity between two posters was the distance between hot and warm color at the background. The Mucha poster is graded from green to red and the opposite applied to the Thor poster. In the image on the top we see the AEG Turbine Factory designed by Peter Behrens, a clear example of the reductive geometric style of Jugendstil art found in Germany post 1900. The building brings together many of the elements of Jugendstill style. The main element being the casting aside many of the decorative elements that saw prominence in the nineteenth century Germany and adopting a new bold approach where the beauty comes from the inherent form itself. In order to achieve this aesthetic celebrating form over decorative elements Behrens chose to have the building constructed from industrial materials only such as concrete, steel, and glass. Moving onto the image on the bottom we now see Walter Gropius’ Bauhaus building. 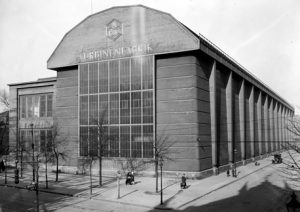 Looking at the design of this building it is easy to see how Gropius was inspired by Behrens’s AEG Turbine Factory. Much like the Jugendstil movement seen before the war Bauhaus sought to bring back the idea of the craftsmanship seen in medieval workshops and guilds and use that with elements of modern design to produce new functional designs for the modern industrial world. The design of the building is supposed to be aesthetically pleasing while simultaneously functional much like Behrens design. 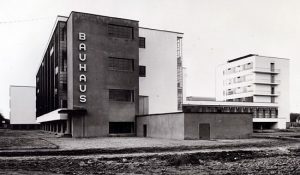 The Bauhaus building owes much of its’ monumental look to the same idea of the simplification of design leaving it exposed to highlight the modern materials used to construct it such as steel, reinforced concrete, and glass. Both buildings are attempting to send the same message of ushering in the modern world through design. The AEG Factory with its functional purpose to provide electricity, seen as the wave of the future, and Bauhaus with it ideas of simplification using geometric abstraction to highlight modern industrial materials to bring sophistication to the design of mass produced products. 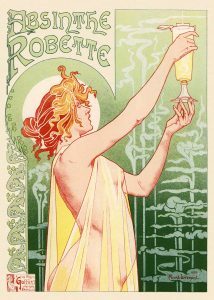 Many characteristics of the art nouveau style are present in this 1896 advertisement for Absinthe Robette. It’s expressive lines, forms, and colours work together to create an overall gentle and sensual feeling throughout the artwork. It is not solely a feeling this imagery brings to mind, but other senses such as taste, touch and smell can also be interpreted by drawing from the many characteristics shown in this piece. Taste is the most prominent sense I receive from this design. It is easy for me to associate the neutral colour tones and soft organic lines with the taste of something refreshing. The texture of the green background suggests the taste/sensation of carbonation. The expressive, organic line work in the background and around the border give off the feeling of a light spring breeze and the smell of wet grass. The contrast of the woman’s warm tones against the cool tones of the background provides me with the sensation of heat from the sun on a warm day. Henri de Toulouse-Lautrec by Jane Avril is an Art nouveau lithography poster. As modernization becomes widely popular throughout Paris, posters were used as advertisements for the popular night spots and entertainers. 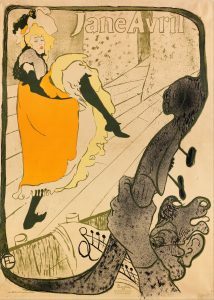 Toulouse- Lautrec captured the life in Montmartre, a section of Paris devoted to entertainment. Through Expressionism, he captures the emotive energy that surrounds him during Art Nouveau Era. As this work connects with the scene of modernity. The emphasis on the outline, tipped-up ground and soft curving lines and its integration of blank paper into the composition demonstrate the impact of Japanese woodblock. The curved, energetic and organic lines depict the mood of a cabaret stage and creates motion. The soft lines used in her dress captures the flow of the dress accurately and it feels as if you can hear her big dress swoosh. The texture of the clothing, floor tiles and walls insinuate the aged and worn look. As we get a close view of the stage and the dancer, her face is almost frowning and looks like she is in woe. To me, it evokes the sad reality of the dancer because she is forced to put on a face and act for the show for others people’s entertainment. The composition of this work is interesting in that the bass player’s instrument and hand are printed in black shading. It becomes a secondary component in the work but because of the musical note and the depiction of the instrument itself, I can almost hear the music playing as the dancer moves her body. Stokstad, Marilyn, and Michael Watt Cothren. Art: a brief history. Pearson, 2016. Meggs, Philip B., Alston W. Purvis, and Philip B. Meggs. Meggs’ History of Graphic Design. Wiley, Hoboken, 2016. 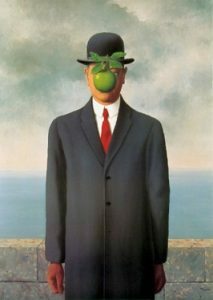 Here are six words that can be used to describe the surrealist movement. Meggs, P. B. (2016). A History of Graphic Design Sixth Edition. John Wiley & Sons. MoMA Learning. Tapping the Subconscious: Automatism and Dreams. LACMA. Drawing Surrealism: Techniques of the Sublime. Suprematism is an artistic movement that focuses on the abstract form of presentation such as geometric shapes, linear elements, and simple color palettes. 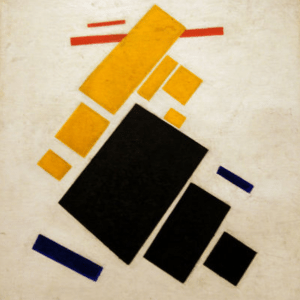 Began in 1913, Russian artist Kazimir Malevich developed his concept of art in the Donkey’s Tail and the Der Blaue Reiter exhibitions, the art style opposed to the Constructivism, based on fundamental geometric forms (mostly circle and rectangle) instead of detailed and delicate painting. The word “Suprematism” refers to the perception of “the supremacy of pure artistic feeling”, which symbolizes the renovation of the art style, proposing that pure feeling is more important than the depiction of any objects. This painting, Airplane Flying was made by Kazimir Malevich in 1915. It depicts the form of a helicopter in rectangular shapes only, with a contrast of yellow, black and red. This simple composition is able to explore the pictorial potential of pure abstraction by been viewed at different distance or angles. What the painting exhibit is more about how the audience visualized the object in their mind by constructing the geometric presentation in their own perception than witnessing what has already shown. In other words, the abstract art is advocating “condensation” of individual feeling rather than visualizing a imagery. 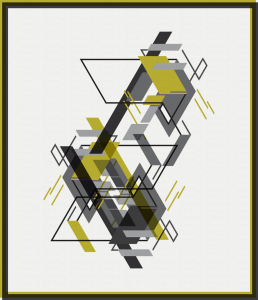 This design is Inspired by the works of Kasimir Malevich, chosen from the series of five cumulative art called “The Study of Suprematism”, published in 2013. The composition depicts the combination of various geometric shapes and contour lines as an unity, which cohesively follows the perception of suprematism: the value of an art is not comprehensively associated with its functionality, what’s more, is about feeling and conscious interpretation of visual elements. The modern decorative art has an innovative extension of suprematism, it’s simple, united and gorgeous, despite over-abstract form of graphics, they work as a decoration, and an objective reflection of designer’s mind. Suprematism has enormously influenced graphic design (especially web design) in 21th century. Thinking about the “flat design”, which has become a major flow beyond the various realm of decoration or designs. The inspiration from the suprematism to the flat design is the different method of “visualization”. Sometimes the simple shapes are more impactful than a detailed illustration since it contains the potential of imagination and further development such as pattern, 2D illustration, or more specific like logotype and symbols. whereas it delivers a sense of technology and clean space at the same time. The geometric shapes highlight the beauty of simplicity, and that’s how it transformed into the logotypes. 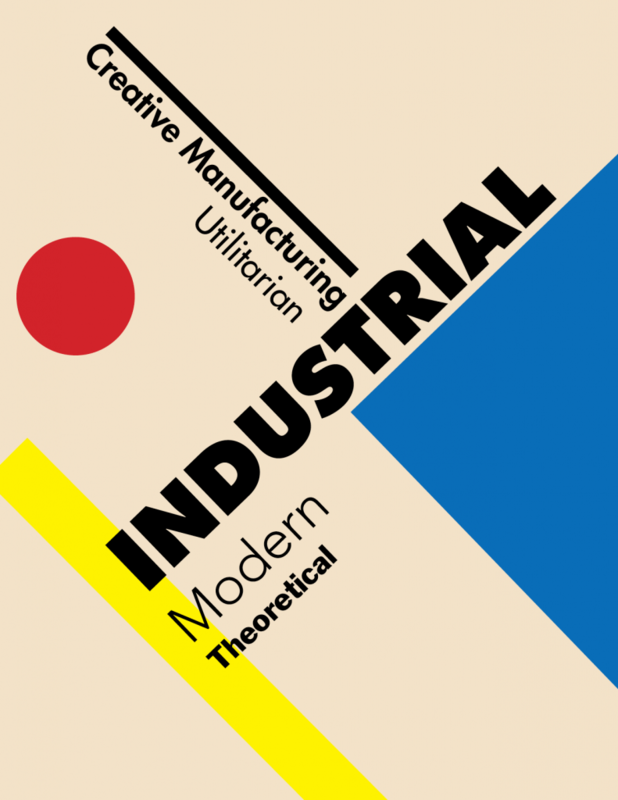 Recently the symbolic elements are the major part in the graphic design, the art style of suprematism can also be thought as the prototype of flat design. Kupferschmid, Indra. “True Type of the Bauhaus.” Fonts in Use, 6 Jan. 2012, fontsinuse.com/uses/5/typefaces-at-the-bauhaus. Lekach, Maya. “Know your design history: The Bauhaus Movement – Designer Blog.” 99designs Blog, 22 Jan. 2018, 99designs.ca/blog/creative-inspiration/know-your-design-history-the-bauhaus-movement/. 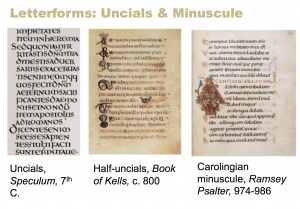 Uncial is a script that commonly used from 1500s to 1900s; the uncial letters were used to write Greek, Latin and Gothic. The early uncial script maybe developed from late Old Roman Cursive. The form of the uncial script can be characterized by board single stroke letters; with simple round forms. The curved form allowed for less strokes and could be written faster. It have no difference between ascender and descender. The media at that time period is mainly parchment and vellum surfaces. Because the form of uncials is smooth and only have a few strokes for letters, so they are suitable to write on smooth surfaces. At that time period, there were no systematic separations of words; Which is not readable and have no visually pleasant.